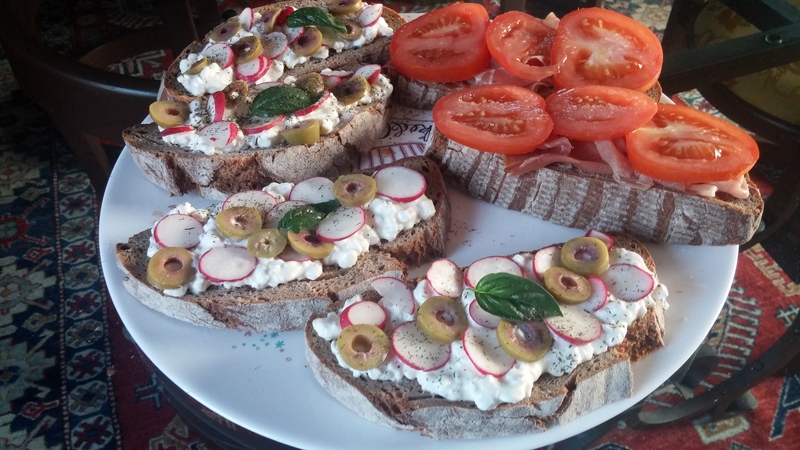 In Italy we make bruschetta’s all year round, but in summer it becomes a quick lunch or dinner or you can use them for your aperitivo. Just by adding a salad on a side and some prosciutto or eggs omelet you have a nice rounded meal which you can prepare in less than 20 min. However, you can be as creative as you want and prepare yours with ingredients you have on hand. There is no limit to your creativity and how you combine ingredients. So, just play around and try your perfect combination. Slice the bred and toast it on both sides, just to get nice thin crust. It should become crunchy on the outside but still soft on inside. 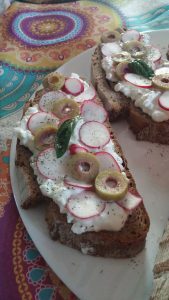 While you are toasting the bread (you can do it in toaster, in oven on grill mode or simply in frying pan) slice the radishes and olives. As soon as you take out warm bread spread the cheese and garnish it with veggies and salt and dill as desired.